Although my above statement may be tongue and cheek, it is certainly not sugar coated. Armed with the understanding that I am facing an uphill battle with the many tempting forms of sugar disguised as healthy sounding options like sorbitol, mannitol, diastatic malt and ethyl maltol.... Okay, I admit I have no idea what those words are, but they are each awesome excuses to indulge my sweet tooth and more proof of the challenge I face. Unbelievably, several of my friends were able to just up and remove sugar entirely for 30 days and I just about blew my fructose filled gasket at the idea of quitting it all cold turkey. So, instead of putting down the cheesecake, I decided to forego only one of my nemesis's at a time: Candy. 1) By removing all forms of candy would I in turn reduce the likelihood of sugar consumption or would I instead choose to compensate with other forms? That fact was, I was simply eating too many sweets as it seemed like after every meal I had to supplement it with a treat of the sweet kind. I really wanted to change. 2) How much would this effect my weight? I had hit a plateau with regards to my weight loss from my previous 30 Day Experiments and was hoping the removal of candy would kickstart another drop in pounds. 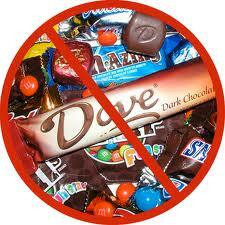 As I began I gave myself a couple guidelines to help me make this transition to the new improved candy-free David. First, gum is NOT candy. Many may argue otherwise, but for the purposes of this experiment I chose to keep them as an option. Second, mints are NOT candy!! For the same reason above. I am happy to say, after a few days of irritated and slightly irrational withdrawal symptoms I am candy-free and haven't really missed it. Interestingly, (but not surprisingly) I experienced both of my reasons for this challenge. As a result of no candy, I actually found myself passing on the treat after meals with regularity and additionally have broke through my weight plateau again. Only by a couple pounds, but I'll take it! !